It wouldn’t be a Chanel show without a wildly imaginative set as the backdrop for the latest collection, and today was no exception. 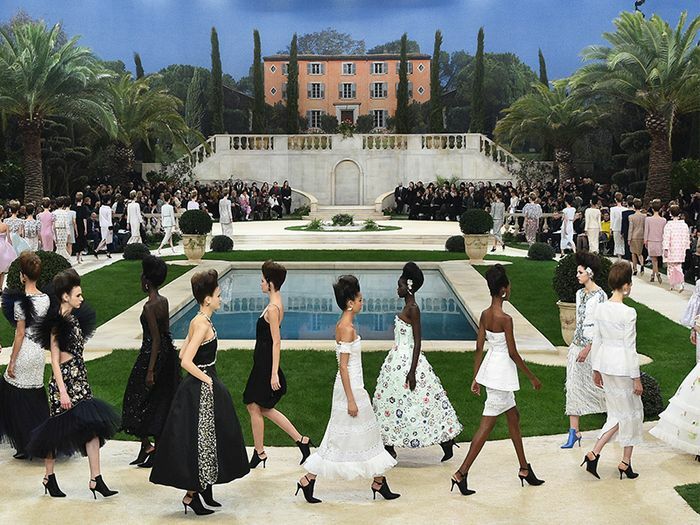 For Chanel’s S/S 19 haute couture show, the Grand Palais was transformed into #VillaChanel, finished with a Mediterranean house set above a sweeping staircase leading to an 18th-century garden complete with a pool and imported plants. While Karl Lagerfeld was notably absent from the show, he weighed in on the collection in Chanel’s press release. “It’s a serene, ideal, timeless collection, that’s absolutely now, with new shapes,” said Lagerfeld. Indeed it was. Models paraded out in pastel dresses, pieces covered in feathers, a beauty look inspired by David Bowie, and a showstopping finale outfit that overtook Instagram. Among the 62 looks were seven trends we predict will be everywhere in 2019. Go on to read about highlights from the Chanel S/S 19 couture show and see which fashion and beauty trends are about to take off. Many of the models were wearing looks with a focus on feathers—and all of them were wearing feather earrings and hair accessories. We've long predicted that feathers will be everywhere in 2019, and here is even more evidence the trend will be huge. We couldn't help but notice all of the candy-colored dresses models wore in today's show at the Grand Palais. While beige is set to be one of the biggest colors this spring, pastels will also be in high demand over the next few months. Besides the finale look, every model at the Chanel S/S 19 couture show was wearing a version of these pointed-toe stiletto boots with a thin strap at the back. Whether a super-high crop or a boatneck blazer style, leather jackets are getting a polished makeover at Chanel. This is something we predict the fashion crowd wearing with everything from denim to dresses. Throwback strapless silhouettes have been continuing to appear on the runways recently, and now they have Chanel's stamp of approval. While we don't exactly predict brides will be walking down the aisle in couture swimsuits, other elements of Chanel's finale bridal look are sure to translate to upcoming weddings. The long train, sparkling silver mules, and jeweled finishes are all details we expect to see among future brides. Chanel's global creative makeup and color designer, Lucia Pica, created the beauty look at the S/S 19 couture show. The inspiration came from a combination of 18th-century romance and David Bowie, resulting in saturated matte-magenta lips and smoky marine eyes. To create the look, Pica applied Chanel Rouge Allure Liquid Powder Liquid Matte Lip Color in Épitome to the lips and then layered Chanel Rouge Allure Velvet Extreme Intense Matte Lip Color in Invincible on top. For the smoky eye, she used Chanel Stylo Ombre et Contour Eyeshadow Liner Khôl in Bleu Nuit and Le Volume de Chanel Mascara for a plump lash. Next, the first trailer for Netflix's new Chanel couture documentary is here.